The Part 11 Toolkit allows users to secure data with electronic signatures. The user selects a record and enters their user ID, password, and the meaning of the electronic signature. Once the user confirms the decision to apply the signature, the entry is locked from further editing. Database security can be customized to allow only certain groups to add or remove an electronic signature. For example, a group Data_Entry might be able to add an electronic signature, but only the Administrator group would be able to remove the electronic signature. Adding and removing electronic signatures is captured on the audit trail. 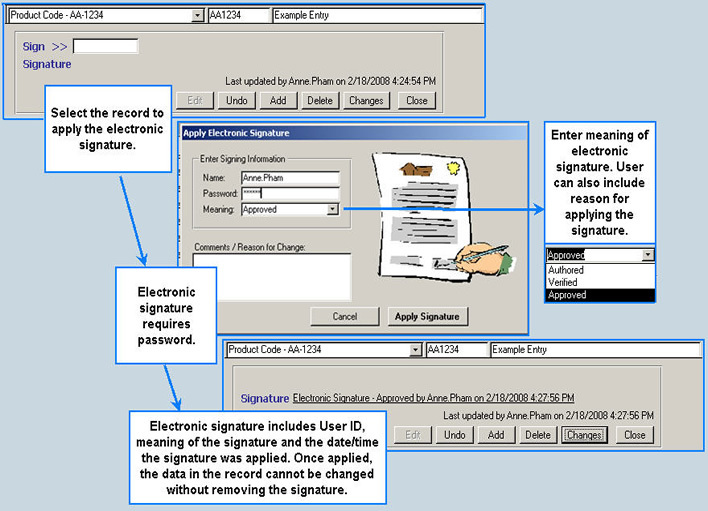 Electronic signatures meet all requirements of 21 CFR 11, subpart B. See how the Part 11 Toolkit adds Audit Trails, Electronic Signatures, Group Security, and a customizable Search Engine to your database. Read the Part 11 Toolkit Frequently Asked Questions. Request a Free Trial Copy of the toolkit for your database.